The epidemiology of hepatitis C virus (HCV) infection is not well defined in the Middle East region. A review of the epidemiology and modes of transmission and spread of HCV infection in regions located in the Middle East, including Iran, Bahrain, Iraq, Oman, Qatar, Jordan, Kuwait, Saudi Arabia, United Arab Emirates, Cyprus, Sudan, Egypt, Pakistan, Syria, Turkey, Lebanon, Gaza Strip and West Bank, and Yemen, was undertaken. Public health strategies, well­programmed, population-based and certain HCV infection at-risk surveys, and transmission risk factors' settings detection are insufficient in some countries of this region. Since significant diffe­rences in prevalence and epidemiology of HCV exist among the Middle East countries or even inside the countries, control strategies should take these differences into account. Few controlled trials have studied the treatment of relapse in adults with minimal change disease. Repeated courses of steroids, cyclophosphamide, cyclosporine and even mycophe­nolate mofetil (MMF), all seem to play a role. The aim of this study was to review and critically analyze the literature regarding the use of immunosuppressive therapy for the treatment of relapse in adults with minimal change nephrotic syndrome (MCNS). An intensive search was done for pub­lished trials in the general medical database. Retrieved studies were further sorted according to spe­cific inclusion and exclusion criteria. Selected trials were critically analyzed and evaluated using the Oxford Centre for Evidence-based Medicine Levels of Evidence, 2009 rating. Six studies were selected and systematically reviewed. One randomized controlled trial compared the use of cyclo­phosphamide versus cyclosporine (11 adults) and showed that both drugs are effective in the treatment of frequent relapses [level 1b evidence (grade B)]. Three trials (total of 20 patients) tested the use of cyclosporine therapy and showed that cyclosporine, though effective in the treatment of relapse, is associated with an extremely high incidence of subsequent relapses following drug with­drawal. A long-term follow-up cross-sectional study of 95 patients, with 69 relapsers, supported the use of steroids in the treatment of occasional relapses [level 2c evidence (grade C)]. One case series described the benefits of MMF [level 4 evidence (grade C)]. Most of the the clinical trials studied were heterogeneous, underpowered by small adult populations, open-labelled, non-randomized, with poor statistical analysis, validity and utility. We conclude that there is poor evidence that successful treatment of the first relapse of adult MCNS can be achieved with a second course of steroids or cyclosporine. Also, there is weak evidence that frequent relapses can be treated using cyclophosphamide, cyclosporine or MMF. Powered, multi-centered, randomized, blinded, controlled trials, with long-term follow-up are required to know the optimal treatment for relapsing adult MCNS. Chemokines play a major role in the process by which leukocytes are recruited from the bloodstream into the sites of inflammation. Genes for the chemokine receptors CCR5, CCR2 and MCP-1 are characterized by functional polymorphisms implicated in transplant rejection. To investigate this association, we analyzed polymorphisms of CCR5-∆32, CCR5-59029-A/G, CCR2-V64I and MCP-1 G/A (-2518) in 173 renal transplant recipients and 169 healthy blood donors. The patients were classified in two groups: Group-1 (G-1) included 33 HLA-identical recipients and Group-2 (G-2) included 140 (one or more) mismatched graft recipients. Forty-two patients had developed acute rejection episodes (ARs): seven in G-1 and 35 in G-2. 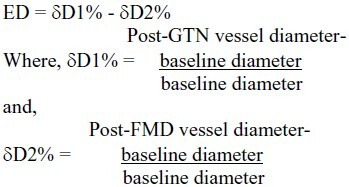 Thirteen G-2 patients developed chronic allograft dysfunction (CAD). The genotypic and allelic frequencies of all polymorphisms studied did not reveal significant differences between patients and controls and among G-1 and G-2 recipients. However, a significant risk of acute renal transplant rejection was found in G-1 patients who possessed the CCR2-64I allele (odds ratio 0.24, 95% confidence inter­val [CI], 0.05-1.06; P = 0.035). There was no significant association of this polymorphism and CAD. In conclusion, the observed association of CCR2-64I with AR should be added to the spectrum of immunogenetic factors known to be involved in allograft renal loss. Little is known about the influence of pre-transplant comorbidities on post-transplant expenditures. We estimated the associations between pre-transplant comorbidities and post-transplant Medicare costs, using several comorbidity classification systems. We included recipients of first-kidney deceased donor transplants from 1995 through 2002 for whom Medicare was the primary payer for at least one year pre-transplant (N = 25,175). We examined pre-transplant comorbidities as classified by International Classification of Diseases (ICD-9-CM) codes from Medicare claims with the Clinical Cla­ssifications Software (CCS) and Charlson and Elixhauser algorithms. Post-transplant costs were calcu­lated from payments on Medicare claims. 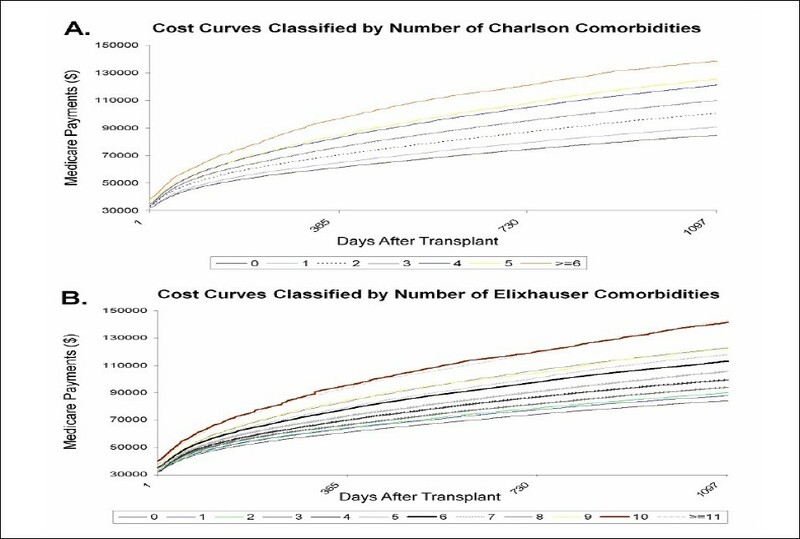 We developed models considering Organ Procurement and Transplantation Network (OPTN) variables plus: 1) CCS categories, 2) Charlson, 3) Elixhauser, 4) num­ber of Charlson and 5) number of Elixhauser comorbidities, independently. We applied a novel regression methodology to account for censoring. Costs were estimated at individual and population levels. The comorbidities with the largest impact on mean Medicare payments included cardiovascular disease, ma­lignancies, cerebrovascular disease, mental conditions and functional limitations. Skin ulcers and infec­tions, rheumatic and other connective tissue disease and liver disease also contributed to payments and have not been considered or described previously. A positive graded relationship was found between costs and the number of pre-transplant comorbidities. In conclusion, we showed that expansion beyond the usually considered pre-transplant comorbidities with inclusion of CCS and Charlson or Elixhauser comorbidities increased the knowledge about comorbidities related to augmented Medicare payments. Our expanded methodology can be used by others to assess more accurately the financial implications of renal transplantation to Medicare and individual transplant centers. To determine the effect of selection of peritoneal dialysis patients who used auto­mated PD (APD) as a first renal replacement therapy (RRT) option, we studied two groups of adult chronic kidney disease (CKD) patients treated with APD over a period of 4 years: group 1 included 30 patients in whom APD was the first choice for RRT and group 2 included 40 patients transferred from failed hemodialysis (HD) treatment. Both groups were matched for the original causes of CKD and comorbid conditions. However, group 1 had significantly higher residual renal function (RRF) than group 2 [glomerular filtration rate (GFR) 11.85 ± 4 mL/min and urine output 995 ± 465 mL/day vs. 3.69 ± 3.7 mL/min and 340 ± 447 mL/day, respectively, P = 0.0001] and Kt/v (2.7 ± 0.7 vs. 1.9 ± 0.4, respectively, P = 0.006). Most of the patients were compliant with their APD prescription, performed ideal PD techniques, achieved adequate dialysis and fluid ultra­filtration, and experienced much less than average infectious and non-infectious complications. However, group 1 achieved better clinical outcome than group 2, including relatively higher sur­vival rate and kidney transplantation, significantly fewer episodes of peritonitis per year (0.09 vs. 0.14, respectively, P = 0.0001), higher serum albumin (2.95 ± 0.3 vs. 2.7 ± 0.27 g/dL, respectively, P = 0.035), hemoglobin (11.5 ± 0.9 vs. 10.6 ± 0.7 g/dL, respectively, P = 0.022) and lower para­thormone levels (283 ± 117 vs. 389 ± 269 pg/mL, respectively, P = 0.02). They also maintained significantly higher total fluid removal compared to group 2 (1120 ± 330 vs. 560 ± 300 mL/day, respectively, P = 0.004), higher RRF (GFR 8 ± 2.6 mL/min vs. 1.8 ± 2.4 mL/min, respectively, P = 0.0001), and urine output (556 ± 447 mL/day vs. 240 ± 347 mL/day, respectively, P = 0.004), and significantly higher Kt/v (2.8 ± 0.7 vs. 1.9 ± 0.4, respectively, P = 0.2). In conclusion, in CKD patients, PD is a viable initial modality of RRT, and with better RRF may have a better outcome than as a secondary choice. Peritoneal dialysis (PD) is a well-established modality for treatment of patients with end­stage renal disease, giving excellent patient and technique survival rates. In Saudi Arabia, data collected by the Saudi Center for Organ Transplantation showed that in 2008, patients on PD accounted for a mere 4.8% of total patients on renal replacement therapy, including hemodialysis and renal transplantation. This study was conducted to identify the characteristics of membrane per­meability in the Saudi population and to assess the role of various factors affecting solute transport across the peritoneal membrane. We followed up a total of 52 patients on Continuous Ambulatory Peritoneal Dialysis (CAPD) as well as Automated Peritoneal Dialysis (APD), being treated in the PD unit of the King Khalid University Hospital, Riyadh. There were 30 female and 22 male patients; 14 patients were using CAPD while 38 patients were on APD. The mean age of the patients was 50.5 years, with a range of 14-86 years. The average body mass index (BMI) was 27.1 kg/m 2 and the mean body surface area (BSA) of the study patients was 1.71 m 2 . A standardized PET test was performed on all patients, 4-6 weeks after initiation of regular PD. The Kt/V and creatinine clearance measured 6-8 weeks after initiation of dialysis were 1.96 and 56.59 L/week, respectively. Residual renal function was assessed on the basis of daily urine output, using 24-hour urine collection. The mean serum urea con­centration was 16.91 mmol/L and mean serum creatinine was 702 μmol/L. According to the Peritoneal Equiliberation Test (PET), 8% of the subjects belonged to the high trans-porter category, 44% patients belonged to the high-average transport group, 46% to the low-average category and 2% came in the low transporter category. Our study suggests that the patient characteristics and demographic para­meters seen in the Saudi population are comparable to those seen in other studies from the Middle East and worldwide, including data collected from Canada, New Zealand and Mexico. To determine whether contrast induced nephropathy (CIN) post coronary angio­graphy procedure can be prevented in chronic kidney disease (CKD) patients by continuous venovenous hemofiltration (CVVH), we evaluated 98 CKD patients [52 (53.1%) were males, the mean age was 60.7 ± 11.0 years] who underwent coronary angiography from January 2004 to December 2006. Serum creatinine (Cr) before the procedure was 411 ± 79.9 μmol/L and crea­tinine clearance (Cr Cl) was 18.04 ± 4.26 mL/min. All patients underwent post procedure CVVH for 21.34 ± 2.12 hours. The mean time interval between the procedure and the start of CVVH was 44.3 ± 18.8 min. The mean serum Cr at discharge was 403 ± 88.4 μmol/L (Cr Cl 18.5 ± 4.61 mL/min) and was 423 ± 88.9 μmol/L (Cr Cl17.6 ± 4.27 mL/min) 15 days after the procedure. One patient (1.02%) developed worsening of renal functions that required repeated CVVH during hospitalization and ended up on regular hemodialysis. There was no in-hospital mortality. We conclude that CVVH is effective in preventing CIN after coronary angiography in CKD patients. The aim of our study was to find out a new indicator with a higher specificity level than prostate prostate-specific antigen (PSA) in order to achieve a better selection of patients who will undergo prostate biopsy. Trans-rectal ultrasound-guided prostate biopsy was performed in 135 patients who had elevated PSA level and/or palpable nodule on digital rectal examination. The PSA level was ≤10 ng/mL in 81 patients and >10 ng/mL in 54 patients. We designed a new formula consisting of prostate volume, patient's age, and free prostate specific antigen. Its resultant was defined as prostate biopsy index and was compared with the most currently used parameters. Histology results yielded prostate gland malignancy in 40 (30%) patients. Our new index differed significantly between the malignant and the non-malignant patient categories (P = 0.01). The ROC curve analysis at different specificity and sensitivity levels (85%, 90% and 95%) and regarding the area under the curve (AUC), our new index was significantly better than the other studied parameters (P = 0.001). Additionally, the AUC in patients with a PSA level ≤10 ng/mL and bet­ween 10.1 and 20 ng/mL was 0.75 and 0.78, with a sensitivity of 91% and 83% and a specificity of 24% and 73%, respectively, at a cut-off point of 1.7. The overall sensitivity and specificity at the same point were 80% and 41%, respectively. In conclusion, the performance of our new index was superior to all other evaluated parameters. At 83% sensitivity with a cut-off point of 1.7, 63.5% of the performed biopsies could have been avoided in patients with a PSA level between 10.1 and 20 ng/mL. The aim of this study was to determine the incidence of associated urological and non-urological anomalies as well as the renal outcome in patients with a congenital solitary func­tioning kidney (CSFK). A retrospective review of 30 consecutive cases of CSFK seen at the pediatric renal service at the Jordan University Hospital between 2004 and 2008 was performed. There were 20 males and 10 females, whose ages ranged from five days to 14 years. 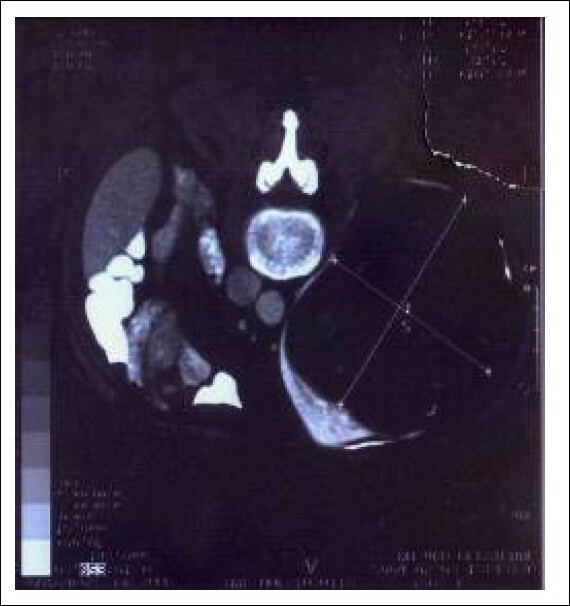 In 20 patients (67%), the left kidney was absent. Associated anomalies were detected in 23 (77%) of the 30 patients; urological anomalies accounted for 47% (14/30) and non-urological anomalies were found in 19/30 (53%) patients. The latter included anomalies of the ear, nose and throat (ENT) in 9/30 (30%), musculoskeletal system (one with hypermobile joints) in 8/30 (27%), gastrointestinal (GI) in 7/30 (23%), cardiovascular (CV) in 4/30 (13%) and dermatological with epidermolysis bullosa, endocrine (euthyroid goiter) and gynecological (cervical cyst) in one patient each (3%). Proteinuria was seen in 6/30 (20%) and hypertension in 2/30 (7%) patients. Chronic renal failure (CRF) was seen in 6/30 (20%) patients, of whom three had end-stage renal failure (ESRF). CRF was seen mainly in patients with more than two associated urological anomalies. Idiopathic hyperuricosuria was found in five of the six tested patients (83%). In our study, the most common associated anomalies with CSFK were urological. The presence of more than two associated urological anomalies increased the risk of CRF. Urinary anastomotic complications following renal transplantation cause significant patient morbidity. In ureteric reconstruction, different techniques are used to reduce complications (such as leakage or obstruction). In this study, we suggested two aspects of management of the complications of ureteral anastamosis: ureteral spatulation more than 10 mm for prevention and percutaneous nephrostomy and balloon dilatation as the first steps of treatment. A sequential double-blind random trial with 170 kidney transplant recipients was performed, dividing the patients into two groups: group 1 patients had ureteral spatulation length ≤10 mm (70 recipients) and group 2 patients had ureteral spatulation ≥10 mm (100 recipients). In patients with ureteral stenosis, percutaneous nephrostomy (PCN) and balloon dilatation were used as the first step of treatment. The mean age was 44 ± 4.2 years. Before and after removing the double J stent, ure­teral complications that needed surgical intervention occurred in 16/70 recipients in group 1 (20.3%) and in eight/100 recipients in group 2 (8%). There is a significant difference between the two groups (P < 0.05). PCN and balloon dilatation were performed in 24 patients with ureteral stenosis. Eleven patients had a good response and 13 patients underwent surgical procedures (in four of theses patients, ileal interposition was used for repairing the ureteral defects). In con­clusion, ureteral spatulation more than 10 mm in prevention of ureteral stenosis and use of PCN and balloon dilatation in the first step of treatment of ureteral obstruction should be the manage­ment choice for these patients. To determine the antihypertensive benefit of adding low dose sprinolactone to multi­drug regimens that included a diuretic, a calcium channel blocker and angiotensin-converting enzyme inhibitor or angiotensin receptor blocker in patients with moderately severe chronic kidney disease (CKD) [glomerular filtration rate (GFR) 25-50 mL/min] and resistant hyper­tension, we studied 41 patients randomly divided into two groups: group 1: patients who received placebo as spironolactone and group 2: patients who received spironolactone 25-50 mg/day. The patients were evaluated during follow-up at the 6th and 12th weeks. The mean decrease in systolic and diastolic blood pressure after 6 weeks of spironolactone was 33 ± 8 and 13 ± 2 mmHg, respectively, and it was maintained after 12 weeks of spironolactone wherein the values were 36 ± 10 and 12 ± 2 mmHg, respectively, while there was no change in the blood pressure in the control group. Hyperkalemia (serum potassium >5.5 meq/L) occurred in one subject in the spironolactone group. We conclude that low-dose spironolactone may provide a significant additive blood pressure reduction in CKD patients (stage 2 and 3) with resistant hypertension. Urinary reflux can cause irreversible complications such as reflux nephropathy and ESRD. 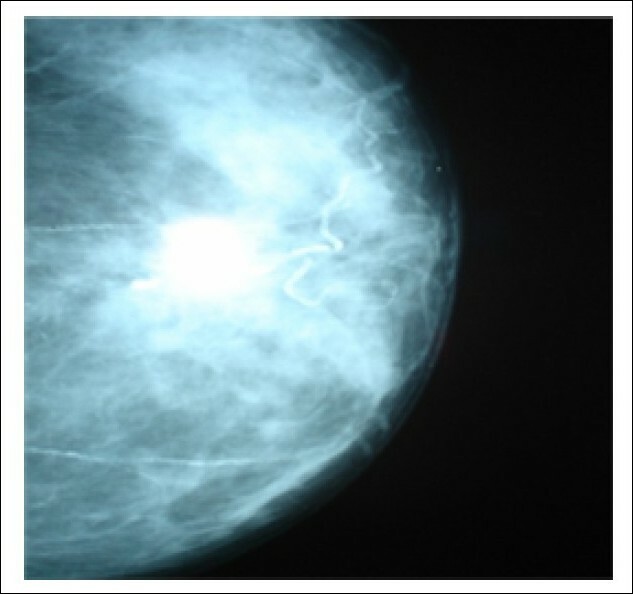 Diagnostic imaging such as voiding cystourethrogram (VCUG) is invasive and causes irradiation. Several studies have shown that markers such as urine IL-8 or serum Procalcitonin might be useful for the diagnosis of vesico-ureteral reflux (VUR) as a substitution for invasive methods. The aim of this study was to determine and compare the mean urine Ca/Cr ratio and hypercalciuria between two groups of children aged 2-10 years affected by VUR. This is a cross-sectional study in which 32 chil­dren having the following entrance criteria were included: children 2-10 years old not affected by uri­nary tract infection during the last three months and their reflux or recovery having been diagnosed by VCUG or direct radionuclide cystography, divided into two groups of affected by reflux and recovered from reflux. Then, the point urine specimens were collected with permission of their parents in a single laboratory and urine Ca and Cr for each specimen were measured. The Ca/Cr ratio was calculated for each child to evaluate Ca excretion from the urine, which was possible without collecting the 24-hours urine. The Ca/Cr ratio mean and the hypercalciuria were compared between the groups. To analyze our data, the Mann-Whiney test and the Chi-square test were used, using SPSS V.15. Thirty-two children, including 18 children recovered from reflux and 14 affected by reflux, were entered in our study. The Ca/Cr ratio mean was 0.692 ± 1.874 for the affected and 0.118 ± 0.187 for the recovered group. The Ca/Cr ratio mean for the affected male and female groups was 0.012 ± 0.008 and 0.805 ± 1.0913, respectively. This amount was 0.0175 ± 0.01767 for the recovered male and 0.131 ± 0.195 for the recovered female group. There was no significant statistical difference between the groups with res­pect to the Ca/Cr ratio mean, but there was a significant statistical difference between the two groups of females (P-value = 0.026). Also, there was no significant statistical difference between the two groups of males relative frequency of hypercalciuria was significantly higher in the group affected by reflux than in the recovered from reflux group (P-value = 0.017). Urine Ca excretion is elevated in children with reflux, and may be more useful as an appropriate marker for the diagnosis of VUR than other invasive methods. Patients infected with H1N1 virus may develop pneumonia and acute kidney injury (AKI). To determine the epidemiological characteristics, clinical features, management and out­comes of patients with confirmed H1N1 complicated by pneumonia and AKI and treatment with oseltamivir and to identify the prognostic indicators, we studied all the patients with a confirmed diagnosis of H1N1 infection with pneumonia and AKI, using real-time reverse transcriptase­polymerase chain reaction (RT-PCR) assay, between October 2009 and March 2010. H1N1 infection was confirmed in 20 patients with pneumonia and AKI; the mean age was 42.8 ± 18.2 years and 12 (60%) of the patients were males. Eleven patients were between 15 and 50 years of age, and 15 had preexisting medical conditions. All patients had fever, cough, dyspnea or respiratory distress, increased serum lactate dehydrogenase levels, pneumonia and AKI. Fifteen (75%) patients required mechanical ventilation and 14 (70%) died. None of the health care workers developed influenza-like illness, when they received oseltamivir prophylaxis. Mortality was associated with higher Acute Physiology and Chronic Health Evaluation (APACHE) II, Sequential Organ Failure Assessment score (SOFA), Multiple Organ Dysfunction Score (MODS), XRChest score, in addition to requirement of inotrope, ventilator support, renal replacement therapy (RRT), and presence of underlying risk factor for severe disease. This report describes and explores the impact of a series of faculty-led faculty de­velopment programs underpinned by principles of distributed educational leadership. We aimed to prepare faculty for their roles as facilitators and assessors in a newly implemented problem-based (PBL) graduate entry medical program. We asked participants attending a series of faculty deve­lopment programs to evaluate workshops attended using an in-house designed survey. Overall descriptive statistics for all workshops and qualitative feedback for PBL workshops alone were examined. It was concluded that clinical faculty who are not specialized in medical education can offer high-quality, well-accepted training for their peers. Faculty development, underpinned by a distributed leadership approach which supports learning organization tenets, imaginative, flexible and democratic approaches to developing and nurturing expertise at all levels of the organization, is likely to lead to improvements in medical education. Despite the limitations of the survey approach to evaluation of faculty development programs, the information provided is useful both as a basis for decision making and program improvement. The objective of this study was to assess the various factors affecting endothelial function in essential hypertensives and to establish a relation between them in a regression model. Also, the micro-inflammatory state that is known to exist in essential hypertension was evaluated. Sixty newly detected patients of essential hypertension not on any prior treatment and classified into Stage-1 or Stage-2 hypertension according to the JNC-VII criteria were recruited in the study. After a detailed history and physical examination, investigations including blood urea, serum creatinine, blood sugar (F), S. lipid profile (F), urine for albumin, sugar and sediments, X-ray of the chest, ECG and fundus examination were carried out. Urine for microalbuminuria, Hs-CRP and brachial artery reactivity were tested as markers of endothelial dysfunction and inflammation. The CRP levels, taken as a marker of inflammation in hypertension, were significantly elevated in a majority of the study subjects. Endothelial dysfunction was significantly more quantified in Stage-2 hypertension as compared with Stage-1 hypertension (P < 0.01). The Hs-CRP levels were consistently found to be elevated in both the stages of hypertension in our study, with an insignificant difference between the two groups. A significant association was noted with the stage of hypertension, triglycerides, microalbuminuria, CRP, LDL cholesterol and age, with the stage of hypertension emerging as the most powerful predictor variable (P < 0.0001) followed closely by microalbuminuria (P < 0.0001) in a multiple regression analysis model. The present study reinforces the view that hypertension is in part an inflammatory disorder. Endothelial dysfunction is an important component of essential hypertension, the severity being determined by the stage of hypertension, microalbuminuria, LDL-cholesterol, triglycerides, age and Hs-CRP levels independently. The undesirable inflammatory response can be cost-effectively prevented at various levels by targeting the potentially modifiable risk factors elucidated in the study. Fulminant hepatic failure (FHF) is a rare but well-recognized complication of pri­mary herpes simplex virus (HSV) infection in immunocompromised patients. Here, we report two cases of acute hepatitis and FHF secondary to primary HSV type 1 infection following renal transplantation in the absence of any mucocutaneous manifestation. High levels of HSV type-1 DNA were detected in the blood. Both patients were seronegative for HSV 1 and HSV 2 immuno­globulin G (IgG) before transplantation, whereas the donor of patient 1 was HSV 1 IgG-positive but had no viremia and the donor of patient 2 was HSV-seronegative. Patient 1 recovered with acyclovir and immunoglobulin whereas patient 2 did not respond and succumbed to death. HSV­seronegative patients are potentially at risk of developing severe primary HSV disease following transplantation, particularly in the absence of routine anti-viral prophylaxis. HSV infection should always be excluded in transplant patients with hepatic dysfunction. We report two cases of drug interaction between rifampicin and sirolimus in renal trans­plant patients who were diagnosed with tuberculosis after transplantation and induction of immuno­suppressive therapy with sirolimus. The dosage of sirolimus had to be increased, in one case up to six-fold and in the second case up to five-fold, to maintain serum levels after starting the rifampicin. The two patients tolerated the treatment well, with no signs of tuberculosis and good renal function. Castleman's Disease (CD) is an uncommon and poorly understood disorder of lymph node hyperplasia of unknown etiology. This entity belongs to the atypical lymphoproliferative disorders, a heterogeneous group of diseases characterized by a hyperplastic reactive process involving the immune system. The association of the nephrotic syndrome and CD is extremely rare and their interrelation remains enigmatic. We report a case of CD of the hyaline-vascular type with unicentric localization complicated by nephrotic syndrome. Sarcomatoid renal cell carcinoma (SRCC) is an aggressive tumor variant thought to arise predominantly from differentiation of clear cell carcinoma. A few reports of SRCC asso­ciated with non-clear cell tumors led to the presumption that SRCC may arise from any renal cell carcinoma, although direct evidence of this is lacking. 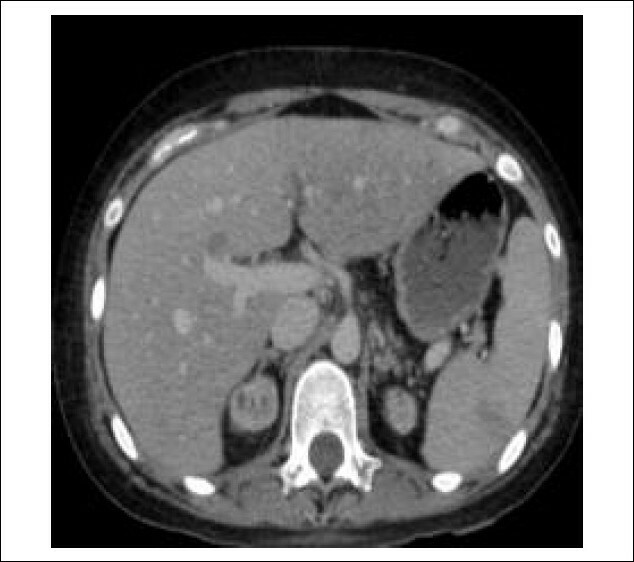 We report a case of a 70-year-old male patient, who presented with acute left upper quadrant abdominal pain and was diagnosed to have SRCC after pathological examination. The patient is on high dose interleukin (IL-2)-based immunotherapy and is apparently free of disease six months after surgery. BK virus (BKV) is increasingly found as an important cause of allograft nephro­pathy. Nephrotic syndrome is not a usual manifestation of BKV nephropathy. 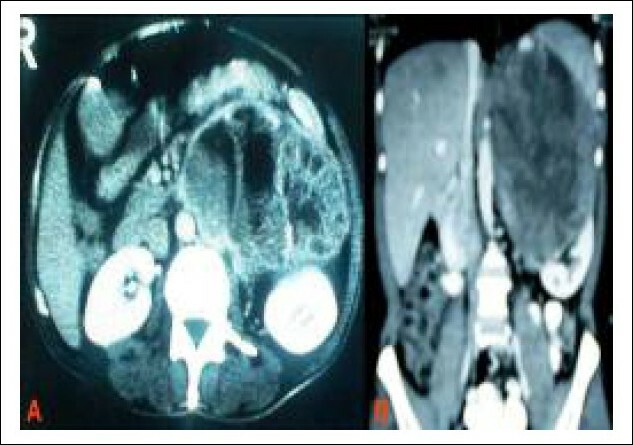 Here, we report a 12­year-old boy, a case of end-stage renal disease due to nephronophthisis, who got the kidney trans­planted from a 16-year-old cadaver, and after 18 months of uneventful transplantation on triple immunosuppressive therapy (Mycophenolate mofetil (MMF), cyclosporin and prednisolone), pre­sented with nephrotic feature (edema, heavy proteinuria, hypoalbuminemia and hyperlipidema). 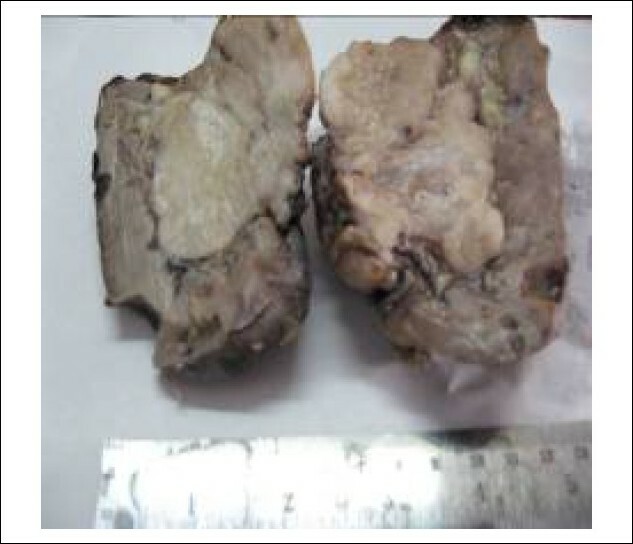 Kidney biopsy was in favor of BKV infection and eventually ended in graft failure. Deposit glomerulopathies are characterized by fibrillary deposits of various sizes, mainly in the mesangial area. Collagenofibrotic glomerulopathy is a rare type of such fibrillary glomerulopathies characterized by deposits of 60-80 nm fibrils in the sub-endothelial and mesan­gial areas. It is also associated with increased levels of serum pro-collagen type III peptide (PIIINP). Although most of the initial reports have emanated from Japan, many other scientists around the globe have later reported this disease. Possibility of systemic disease affecting metabolism of type III collagen is postulated but so far no such association has been identified. We report a 26-year­old male patient who presented with insidious onset of febrile illness associated with lympha­denopathy and proteinuria. Lymph node biopsy revealed features of Hodgkin's lymphoma while percutaneous renal biopsy showed features of collagenofibrotic glomerulopathy. 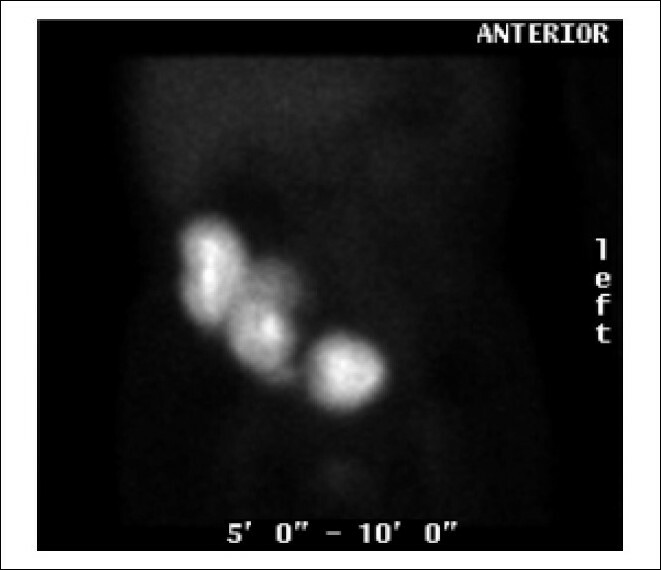 A 29-year-old woman presented with unilateral loin pain because of severely hydro­nephrotic kidney due to deposits of pelvic endometriosis. Double J-stent was placed beyond the obstruction and she was started on hormone therapy. The stent was removed after three months when back pressure changes had resolved. This case is being presented along with a short relevant discussion, due to rarity of ureteral involvement by endometriosis. Since the 1960s, regular hemodialysis (HD) was recognized as a risk factor for the development of infective endocarditis (IE), particularly at vascular access sites. The present report describes our experience at the Etat Major General Agadir, Morocco, of taking care of IE in patients on regular dialysis. A retrospective analysis was made of five cases of IE in patients receiving re­gular HD having arteriovenous fistula as vascular access. They were sent from four private centers and admitted in our formation between January 2004 and March 2009. Infective endocarditis was detected after 34.5 months following initiation of dialysis. The causative organisms included Sta­phylococcus and Enterococcus in two cases each and negative blood culture in one case. A recent history of infection (<3 months) of the vascular access was found in three cases. Peripheric embolic phenomena were noted in two cases. A pre-existing heart disease was common and contributed to heart failure. Mortality was frequent due to valvular perforations and congestive heart failure, making the medical treatment alone unsatisfactory. Two patients survived and three of our patients received a prosthetic valve replacement, with a median survival after surgery of 10.3 months/person. The clinical diagnosis of infective endocarditis in regularly dialyzed patients remains difficult, with the presence of vascular calcification as a common risk factor. The vascular catheter infections are the cardinal gateway of pathogenic organisms, which are mainly Staphlococcus. The prognosis is bad and the mortality is significant, whereas medical and surgical treatments are often established in these patients who have many factors of comorbidity. Nocturnal enuresis is a common problem among children and adolescents. Data regarding this problem in schoolchildren in Yemen are scarce. This study was aimed to determine the prevalence of nocturnal incontinence in Aden school going children, describe its severity and identify the relation between nocturnal enuresis with personal and family characteristics. The study was a cross-sectional survey conducted on the public basic schoolchildren in Aden, Yemen, in the period November 2007-April 2009. A random, multistage sample of 890 students was taken from four districts in eight schools and divided into two strata: males and females. Data were obtained by using pre-recoded questionnaire, which was completed by parents. The response rate was 73.7% (656 students); 113 (17.2%) cases of nocturnal enuresis were encountered. Nocturnal enuresis de-creased by age from 31.5% at 6-8 years to 8.7% at 15+ years (P < 0.05). Primary nocturnal enuresis affected 76.1%, of which the majority of children were bedwetting every night. Positive family history of nocturnal enuresis, deeper sleep, daytime enuresis, tea drinking, being non working father or with less education showed significant association with the occurrence of enuresis in the students. Stressful events in the previous 6 months of the study were twice more frequently noted. The study concluded that the prevalence of nocturnal enuresis in Aden public school children and its associated factors are almost comparable with that reported in epidemiological studies from various countries. Health education will encourage the parents to be aware, cope with this problem and seek appropriate medical advice. This retrospective analytical study aimed at making a database of patients who underwent renal transplant from 31 December 2004 to 31 December 2006 under the Faculty of Medicine renal transplant program. The objective was to build a profile of renal transplant patients with focus on post KT infections and complications of renal transplants. An interviewer administered questionnaire was used. A total of 72 patients were studied; 18 (25%) had died by February 2007. Forty-three patients (58.3%) were interviewed in person, 17 were interviewed over the phone and 12 patients could not be contacted. Of those who were interviewed, 28 (38.9%) were on azathioprine, prednisolone and cyclosporine, while 15 (20.8%) were on predni­solone, cyclosporin and mycophenolate mofetil. Four patients had symptomatic cytomegalovirus infection and five had tuberculosis post transplant. Of all infections, the most commonly reported was urinary tract infection (11 cases). Thirty-three (45.8 %) had received induction therapy with either basiliximab (n = 8) or daclizumab (n = 25). Acute rejection was the most commonly en­countered complication, with nine cases (12.5%) being reported over the study period. Of late complications, most were due to immunosuppression. Overall, the 2-year survival was 75%. There was no significant difference between the centers of transplant. This study was performed to study the immune response to hepatitis B virus (HBV) vaccine in health-care workers. Through a cross-sectional study, relevant information and blood samples from 151 healthcare workers at the Firuzgar hospital were studied. The age range of the study individuals was 20-59 years, with the mean and standard deviation being 35.11 and 10.06, respectively. There were 24 males (15.9%) and 127 females (84.1%). The mean and median of months after HBV vaccination was 63.42 and 49.00, respectively. The mean and median of anti­HBs titer in those who received HBV vaccination was 164.81 and 200 milli international units per milliliter (mIU/mL), respectively. Of the 129 HBV-vaccinated subjects, 103 (68.2%) had anti­HBs titer >10 and 26 (17.2%) had anti-HBs titer <10. There was no association between gender and anti-HBs titer, but vaccination and adequate completion of its courses were associated with higher anti-HBs titer (P < 0.05). Also, the logistic regression method showed that the association between duration after vaccination and age with anti-HBs titer was not statistically significant. Our study suggests that the HBV vaccine immunization program had obtained excellent efficacy. There is need for further investigation among subjects who are not vaccinated against HBV but are positive for anti-HBs as well as in HBV-vaccinated subjects with low anti-HBs titers, about possible low-level viremia and other causes of lower vaccine efficacy, particularly in health-care workers. Chronic renal failure (CRF) represents the major cause of mortality in the nephro­logy unit in Ivory Coast because the means for appropriate management are lacking. The present study was performed to investigate the risk factors for CRF so that strategies for prevention could be elaborated. A case-control study was performed prospectively at the Yopougon Teaching Hos­pital in Abidjan from January 2006 to December 2006. Factors known to cause CRF were investigated in patients and controls. Their prevalence rates were compared with the general population. A total of 280 patients and 113 controls were recruited. The mean age of the patients was 37.88 ± 13.33 years and that of the controls was 41.5 ± 9.72 years. Both genders were equally represented. The main causes of CRF were chronic glomerulonephritis (47.48%), with HIV infec­tion accounting for 15% of them, and essential hypertension (HTA) (25%). Essential HTA repre­sented the only factor which, if untreated, inevitably leads to CRF. Thus, our study indicates that HTA is a major public health concern. All efforts should be implemented to reduce the high prevalence of HTA and the deleterious effect of this disorder in Ivory Coast.